The Rapid Pro offers a wide variety of folding patterns: French lateral fold, single, double or French cross fold. *Capable of handling a maximum item size of 40 inches (101 cm) wide by 74 (188 cm) inches in length. Accompanies 99 different programs for folding. Reduce the number of mis-feeds with a large feeding station. Synchronous belt drive ensures an accurate folding process at top speeds of 188 ft/min (57 m/min). Stackable take away belt allows for continuous feeding. This access allows you to clear product jams with ease. The hinged doors feature gas sprung cylinders and dual channel magnetic switches. Depending on the availability of floor space, the Rapid Pro has options to suit your needs. 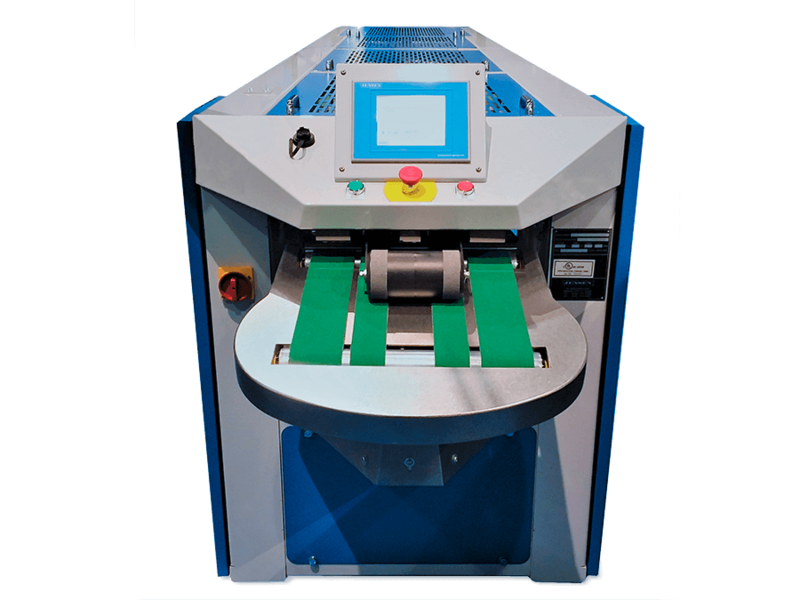 Standard Rear Discharger - allows for the machine to discharge the folded laundry out the back of the machine onto a belt, which can easily be transferred to another belt for efficient material handling. Return to Feeder Option - instead of the laundry being processed out the back of the Rapid Pro, the laundry is simply returned back to the feeder.